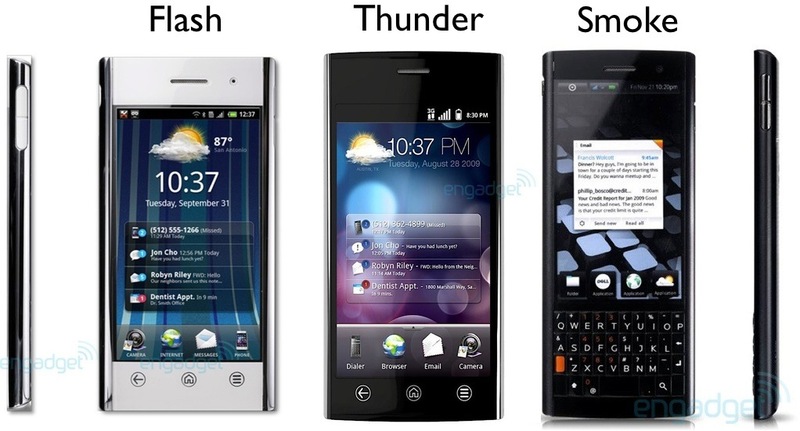 Dell unveiled new phone “leaks”, first with a new Windows Phone 7 slider named the “Lightning”, an Android-based “Thunder”, and now another Android-based “Flash”. New device will be designed around a curved glass casing with a brand new Qualcomm 800Mhz core. Intended for “creative explorers” and “affluent professionals”, Dell is outfitting it with their own Stage UI on top of Google’s soon to be released Android OS 2.2. Dell is planning a 1Q 2011 release on AT&T for the device. Full specs as follows: Android 2.2, codename “Froyo” with Dell Stage UI, 800MHz Qualcomm MSM7230 3.5” WVGA LCD, WCDM 850/1900/2100, GSM 850/900/1800/1900, HSPA 14.4/5.76 Mbps, 5 megapixel camera with LED Flash, AF, IS, & smile/blink detection, 512MB RAM/ROM, microSD expansion to 64GB, WiFi (b/g), Bluetooth 3.0, USB mass storage, A2DP, TV out, HTML5, Flash 10.1, 117 x 58 x 11 mm dimensions, <115g weight (target), Standby 725 hours, Talk 12 hours (target), Predictive text, handwriting recognition, e-compass, accelerometer, proximity sensor.